With the summer slowly approaching it is almost full time BBQ season. With that this is ONE of the great things I like to cook on the BBQ. For Best results look for a Beer Can chicken holder at a hardware store or cooking store. It really makes a world of difference when you have that holder while cooking this. Remove neck and giblets from chicken and discard. Rinse chicken inside and out, and pat dry with paper towels. Rub chicken lightly with oil then rub inside and out with salt, pepper and garlic and Montreal Chicken spice. Set aside. Open beer can and take several gulps , or pour half of the beer into a glass and enjoy slowly. 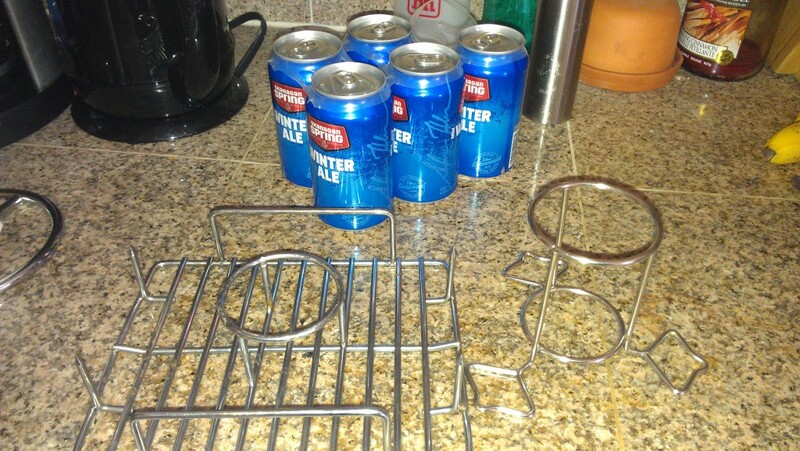 Place beer can on the holder or a solid surface. Grabbing a chicken leg in each hand, plunk the bird cavity over the beer can. Transfer the bird-on-a-can to your grill and place in the center of the grate, balancing the bird on its 2 legs and the can like a tripod. Cook the chicken over medium-high, indirect heat (i.e. no coals or burners on directly under the bird), with the grill cover on, for approximately 90 mins or until the internal temperature registers 165 degrees F in the breast area and 180 degrees F in the thigh, or until the thigh juice runs clear when stabbed with a sharp knife. Remove from grill and let rest for 10 minutes before carving. *CAUTION* When removing the Beer Can from the chicken the beer can and contents will be EXTREMELY HOT!